If you’ve never had grilled duck breasts, you’re in for a revelatory surprise. The contrasts are striking: the smoke of the grill against the richness of the duck fat, the juicy meat capped by crispy skin. At the restaurant, we buy Liberty Farms breasts, which I have found superior to others in taste and texture. They raise a variety of duck called Pekin, a smaller, more compact bird (a single breast is perfect for one person), with a brighter, more delicate flavor and feel. You may have more luck finding Muscovy duck breasts, which are heftier, more steak-like. If you use Muscovy, you’ll only need four breasts to feed six people. Chef Suzanne Goin suggests you marinate the duck overnight, make the gratin in the morning, then reheat the gratin while the ducks are on the grill. Works for us. 2. Cut the bacon into 3/8-inch-thick slices and stack them in two piles, then cut the bacon crosswise into 3/8-inch, even-sided rectangular shapes, or lardons. 3. Heat a large saute pan or Dutch oven over medium-high heat for a minute. Swirl in the olive oil and add the bacon. Cook the bacon about 5 minutes, stirring often, until tender and lightly crisped. Remove to a plate with a slotted spoon, reserving the bacon fat in the pan. 4. Add the onions, 2 teaspoons thyme, 1 teaspoon salt, and some pepper to the pan. Cook 15 minutes, stirring and scraping with a wooden spoon, until the onions start to caramelize. Turn the heat down to low and continue to cook, about 10 minutes, stirring often, until the onions are a deep golden brown. Remove from the heat and set aside. 5. Meanwhile, use a mandoline to slice the potatoes into 1/16-inch-thick rounds. Pour 1/2 cup cream evenly onto the bottom of a 9-by-9-inch (or equivalent) gratin dish. Place one layer of potatoes side by side, slightly overlapping, on the bottom of the dish. Spread a third of the onions over them and scatter a third of the bacon on top. Arrange a second layer of potatoes, drizzle 1/4 cup cream over it, and season with 1/4 teaspoon salt, a healthy pinch of pepper, and 1 teaspoon thyme. Press the potatoes down with your fingers, letting the cream soak up through the layers. This will ensure that the cream is evenly distributed and coats the potatoes well. 6. Arrange another layer of potatoes on top, followed by another third of the caramelized onions and the bacon. Drizzle over another 1/4 cup cream and continue with two more layers of potatoes. Drizzle with 1/2 cup cream and season with 1/4 teaspoon salt and a pinch of pepper. Press the potatoes down with your fingers again. Scatter the rest of the onions and bacon over the potatoes and drizzle with 1/3 cup cream. Season one last time with 1/4 teaspoon salt, 1 teaspoon thyme, and a pinch of pepper. The cream should cover the potatoes but not be soupy. Add more cream if the gratin seems dry. 7. Cover tightly with plastic wrap (yes, it can go in the oven) and then foil. Bake 1 1/2 hours, until the potatoes are tender when pierced. Remove from the oven and carefully uncover. Turn the oven up to 425°F (220°C) and return the gratin to the oven. Cook another 20 minutes or so, until the top is nice and golden brown, as in gratinéed. Let rest at room temperature. Increase the oven temperature to 450°F (230°C). 8. Pound the juniper berries in a mortar until coarsely ground. Score the skin of the duck breasts with a sharp knife and season with the jumper berries and the thyme. Cover and refrigerate at least 4 hours, preferably overnight. 9. Light the grill 30 to 40 minutes before cooking and remove the duck from the refrigerator and allow it to come to room temperature. 10. Using scissors, snip the grapes into 6 clusters. Toss the clusters gently with the olive oil and season with salt and pepper. Roast the grapes on a baking sheet 12 to 15 minutes, until the skin is slightly crisp and starting to blister. 11. When the coals are broken down, red, and glowing, push the embers to one side of the grill. 12. Season the duck with salt and pepper. Place the duck breasts, skin side down, on the cooler half of the grill. As they cook, rotate the breasts in a quarter-turn pattern every 2 minutes or so, to allow the fat to render and the skin to crisp. Turn the breasts over and cook a few more minutes, until the duck is medium-rare and still springy to the touch. 13. Remove from the heat and rest 5 minutes on a wire rack set over a baking sheet. 14. Scatter the greens onto a large warm platter. Slice the duck breasts and place them over the greens. 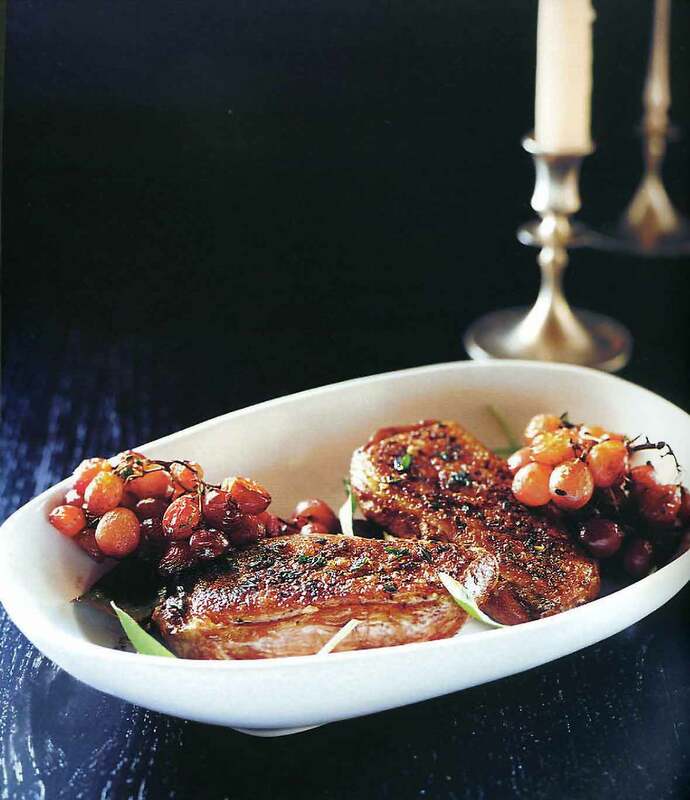 Spoon a little crème fraîche over each duck breast and arrange the clusters of roasted grapes around the platter. Serve the potato-bacon gratin at the table. 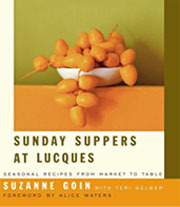 Grilled Duck Breasts with Potato Gratin Recipe © 2005 Suzanne Goin. Photo © 2005 Shimon | Tammar. All rights reserved. All recipes and photos used with permission of the publisher. This is a great recipe – especially the potato dish. We left out the onion in the gratin because we had French onion soup for the first course. We’ve made the potatoes several times since sans the onions because they are sooo good! One of these times we will add the onions. I would NOT use the plastic wrap as directed because it made a terrible mess! No, it does not work well in the oven. Parchment paper would work if you don’t want the foil to touch the food. Magnificent, Peg! Glad you loved this! And we appreciate the thought on the plastic wrap, this is an old recipe and so we’re going to retest it and update the wording and technique as necessary. Thank you!